Customers and employees are happiest when they have context as well as content. Context requires a broad set of voices having one conversation. Too often, companies have initiatives in silos that yield duplicate, contradictory content that doesn’t serve the business' primary goals. 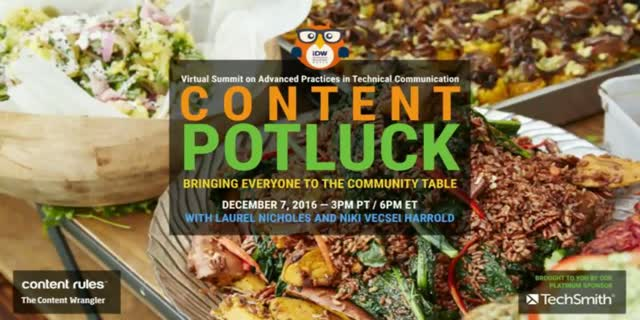 Join Scott Abel, The Content Wrangler, and his two guest presenters, Laurel Nicholes, Director of Tech Comms Services at F5 Networks, and Niki Vecsei Harrold, Director, Community Strategy at Transamerica. In this real-world study, learn how one company built a Community Interlock across all areas of the business, including Marketing, Engineering, Product Management, and Customer Success. With a minimum time investment, the Interlock yields rich community content, programming, and a feedback mechanism to share customer sentiment cross-functionally. It also drives engagement in the community, where customers and employees collaborate. The results? Customers get the information they need in a holistic way in one place. Marketing white papers relate to technical articles, which yield "Ask Me Anything" sessions. We create a knowledge arc that supports customers through their ownership lifecycle.